Twist it, roll it, fold it, soak it. 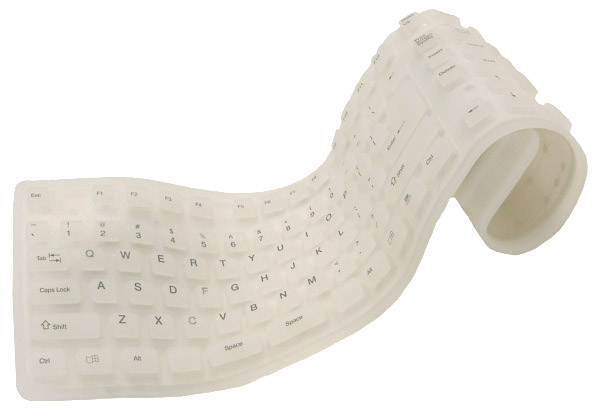 The all new Flexible Compact Keyboard from Adesso is a revolutionary approach to taking PC computing anywhere! It’s water resistant, flexible, and dust and contaminant proof. The keyboard is great for industrial environments, hospitals, libraries, and motor boats. The silicon based material is impervious to almost anything and, it’s easy and fun to use. The flat, comfortable design offers easy typing which eliminates negative-angle stress to your wrists. Its improved raised keys provide better tactile feedback than previous flexible designs. With its water-proof silicone material, you don't have to worry about damaging the keyboard because you can't! You could spill a beverage on it and all you have to do is simply wipe or clean it off and continue to use it, good as new! The keyboard is completely sealed preventing germs from entering anywhere inside the keyboard. Great for medical facilities since the keyboard surface can be washed and disinfected at any time to avoid the spread of infectious disease. The keyboard is lightweight, ultra-slim and very compact. It would be a perfect companion for travel, school, and many industrial or medical environments. It fits easily in your briefcase, backpack or notebook carrying case and you don't have to worry about any sharp edges. The keyboard can be used safely in highly dusty environments. Perfect for factories, industrial warehouses, retail facilities or anywhere where dust may be a present. Easy connection to USB or PS/2 port.